The prevention and elimination of violence against children is an ethical imperative founded on the human dignity of children and their rights to protection from maltreatment enshrined in the Convention on the Rights of the Child and its Optional Protocols, as well as a range of other human rights instruments. The almost universal ratification of the CRC is a potent symbol of the global consensus around the principle that no violence is ever justifiable and all violence can be prevented. At the same time, there is growing awareness that VAC has significant short, medium and long-term economic costs that are borne by individuals, communities and societies. Realizing the right of children to a life free from violence requires public expenditure on child protection and criminal justice systems to safeguard them from harm. At the same time, investment in prevention programmes is required in order to reduce the costs to individuals and society. In all governments’ social policy priorities there are many competing demands on scarce resources. Programmes to prevent VAC must therefore demonstrate a positive return on investment vis-à-vis other calls on public expenditure if they are secure adequate funding. In order to make the investment case for programmes to prevent VAC, estimates of the financial costs of inaction are needed. The economic costs of violence can be broadly divided into two kinds: direct and indirect. 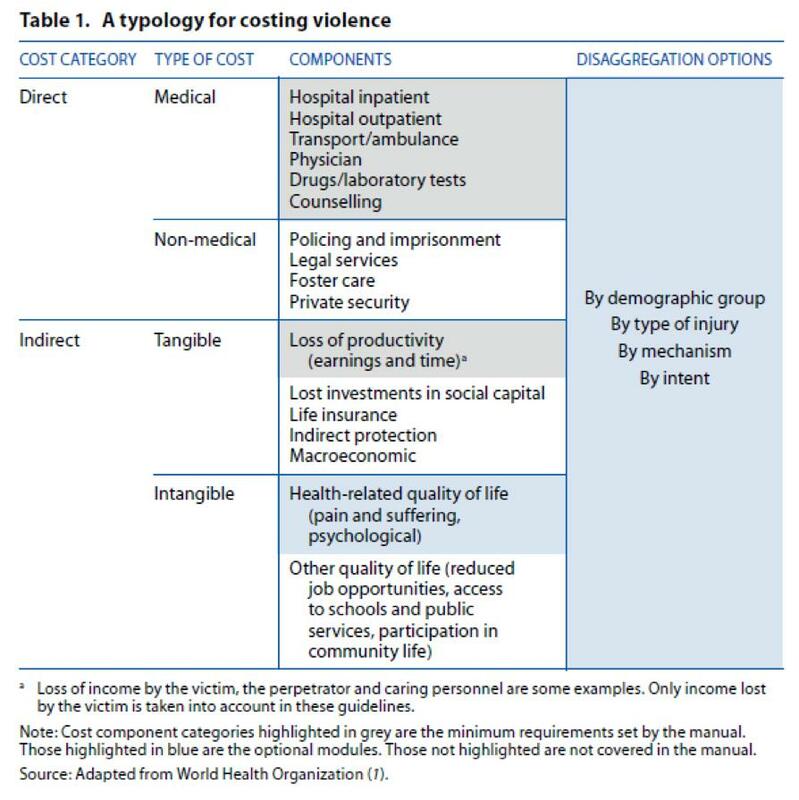 The WHO provides the following useful typology of these two type of costs, which although related to violence in general (including accidental injuries) also applies specifically to VAC. Criminal justice systems incur costs in ensuring that perpetrators of violence against children are punished, and real or potential victims are protected. Less immediately obvious, though potentially much larger, are the indirect future costs arising from the impact violence has on children. The most significant indirect costs are productivity losses arising from the way violence can impede child development. Adults exposed to violence in childhood have lower levels of education, employment, earnings, and fewer assets. There are several mechanisms by which violence reduces human capital formation and causes consequent productivity losses that reduce victims’ lifetime earnings and have a negative impact on society as a whole. Violence against very young children results in long-term exposure to toxic stress and this is known to inhibit optimal brain development. This irreversible impact on the young developing brain can lead to a failure to thrive among affected children and poorer performance once the child enters the educational system. Lower educational attainment has continuing and life-long negative impact on employment and consequent loss of earnings in adulthood. Cumulatively, these losses equate to an economic cost to society. Exposure to violence later in childhood can cause psychological and behavioral problems that disrupt a child’s schooling. These short or long term disruptions in a child’s education may include truancy, coming into contact with the criminal justice system, or placement in non-family care for their protection. The negative impact on a child’s education through these disruptions due to violence leads to a failure to reach full earnings potential with consequent costs to the individual and society. In its most extreme forms VAC causes death. The death of a child entails the loss of all the investment in a child’s development to the point of demise, as well as the child’s future lifetime earnings, and is thus a major cost to the family, community and society. In recent years, a number of studies have developed methodologies to try to make estimates of the various costs of VAC. These estimates have been for individual countries, as well as attempts to estimate the costs of VAC at regional and global level. In order to make estimates for an individual country, researchers must decide on whether to include both direct and indirect costs, and within these types of cost how comprehensively to try to cover all the different categories. A difficulty in making any estimate is the paucity of prevalence data on VAC. When the direct and indirect costs of a category of VAC in a country have been estimated, it is necessary to know how prevalent it is in order to calculate its overall cost. Prevalence data can be drawn from administrative records or sample surveys. In many countries, systems to collect administrative data on VAC are non-existent or incomplete. Methodologies to conduct sample surveys on VAC have been refined in recent years and a number have been carried out. Interest in conducting VAC surveys is growing but the current number remains small. At the global level, calculating the cost of VAC is challenging as there are so few individual country level estimates. It is therefore not possible to reach a global figure by aggregating individual national estimates. Researchers overcome this difficulty by using individual country studies as proxies for “similar” countries. Thus, for example, a cost estimate from a middle-income country in a region is used for all the middle-income countries in that region where no estimates exist. Aggregates of all the estimates that are based on proxies provide the global figures for the cost of VAC that have been published. Literature reviews show there have been only a handful of country studies of the economic impact of VAC, and these are mainly from Europe, the United States and middle-income countries in Asia−Pacific. Appended are summaries of each of the most recent of these country, regional and global studies. All published studies on the costs of VAC acknowledge that figures are very likely to be underestimates of the true figure. The primary reason is that the actual prevalence of VAC is unknown as much of the violence against children, as already noted, is hidden, unreported or unrecorded by governments’ administrative data systems. Where reporting systems are more advanced, there are difficulties in accurately estimating the full impact of VAC and thus capturing all the costs that may be associated with it. For example, the impact of the long-term neglect of children that impedes their development is not manifest until much later in adult life. Projecting these costs into the future requires many assumptions and as each study will make different assumptions estimates are highly variable. The following is a selection of some of the most robust studies that have been published. A study by Child Abuse Prevention Research Australia in 2007 found that the the annual cost of child abuse and neglect was nearly AUS$4 billion (with a lower bound of close to AUS$3.5 billion and an upper bound of over AUS$5.5 billion). Researchers at the Centers for Disease Control of the US Government estimated that in 2008, violence against children in the United States cost at least US$124 billion but depending on the assumptions made could be as high as US$585. The Copenhagen Consensus attempted to put a figure on the global direct and indirect costs of VAC. Extrapolating from a sample of studies from countries that had calculated the costs of all forms of violence, the Copenhagen Consensus estimated that the global cost was US$9.5 trillion or 11% of global GDP. Violence specifically against children, including homicide, child abuse and child sexual violence was estimated at US$3.7 trillion or 4.3% of global GDP. The UNICEF Regional Office for Asia-Pacific commissioned a study to estimate the cost of VAC in that region using findings from country-level studies to make projections for the region as a whole. Using 2004 as the baseline year it found that the total costs were US160 billion or 2% of regional GDP. The Child Fund Alliance commissioned the UK Overseas Development Institute to make an assessment of the global direct and indirect costs of VAC. The ODI published its findings in 2014 and estimated that US$7 trillion is lost due to VAC each year, equivalent to 8% of global GDP. Studies of the cost of VAC also attempt to put its scale into context by reference to the proportion of GNI/GDP that is potentially lost due to expenditure on response, prevention and productivity losses. Again, these estimates vary according to the assumptions made, what types of VAC are included and how comprehensively direct and indirect costs are assessed. But even with these various assumptions, the lowest estimates at national, regional or global level indicate the proportion is not less than 2% and is likely much higher (possibly up to 8-10% of GDP). By any standard, this represent a huge cost to the national and global economy and diverts resources that could be used more productively elsewhere. The next step in advocacy for the investment in prevention programmes is to weigh their cost against the losses that would be avoided by their effective implementation. The Copenhagen Consensus study noted above, examined the benefit-cost analyses of a range of prevention programmes that had been subjected to rigorous assessment. It found there were very high ratios of return from investments in prevention of VaC. A programme in the USA to eliminate physical violence as a method of child discipline, for example, had benefit-cost ratio of 13~14, which is notably high for a social policy intervention. If the prevention and elimination VAC is to have a higher place in the public policy agenda the potential scale of the economic losses it causes, as well as the costs and benefits from prevention programmes needs to be better known. It also requires a greater investment in research on prevalence, both through routine administrative as well as national sample surveys. Building a stronger evidence base from robust studies of the economic burden of VAC and the savings made through effective prevention programmes must be a key priority in the implementation phase of the Post 2015 Sustainable Development Agenda.